Director Jonathan Demme took a great Talking Heads concert and made it better. Now, he chronicles a unique journey home for Neil Young, and likely, takes this to another level as well. Jonathan Demme and Neil Young have previously collaborated on the full-length music performance films, Neil Young: Heart of Gold and Trunk Show. Demme is a master at such material, helming what many consider to be the greatest concert film of all-time, the Talking Heads-centric Stop Making Sense. They teamed up again for Neil Young Journeys, a 2011 film that consists of footage from a Young concert in May of 2010 at Massey Hall in Toronto, Ontario, Canada. A part of his tour supporting the 2010 solo album, Le Noise, Neil Young Journeys features many songs from that album, but there are plenty of older tunes showcased as well. After making the rounds in a limited number of theaters early this summer, Neil Young Journeys comes to home video via a Blu-ray disc that looks and, more importantly, sounds amazing. Neil Young Journeys is a hybrid of sorts, as it features stellar live performance pieces by Young, but it also ventures pretty far into pure documentary territory; far more than their previous three feature films. The documentary aspect takes up roughly � of the running time, and involves Young driving around his hometown of Omemee, Ontario, as he points out landmark locations, whilst telling stories from his youth. The performance footage is simply outstanding, with an eclectic selection of Young�s tunes that is refreshingly heavier on �deep cuts� rather than simply being hit-heavy. Other than maybe �Ohio,� those not fully-versed on Young�s incredibly extensive song catalog might feel a bit put-off if they get a look at the list of tunes performed in the film. Rest- assured, casual Young fans (a group that I proudly belong to), despite the lack of �Old Man,� �Heart of Gold,� and �Southern Man,� Neil Young Journeys is full of songs I�d never heard before, played with such precision and creativity that I�ll never forget them. The film appears in 1.78:1 anamorphic widescreen, and, while never spectacular, still suits the material quite well. It�s most impressive during the concert footage, as the low-end HD equipment enhances the dark, intimate, almost haunting feeling that some of Young�s songs leave us with. The audio is the real highlight of this disc, though, as it takes these already great songs to an entirely other level. This DTS-HD Master Audio 5.1 mix is pretty low-key during the documentary footage, but once the first song begins, the entire sound field springs to life, with incredible clarity, and a bass presence that packs one hell of a punch. The extras include Journey to Slamdance: A Conversation with Neil Young & Jonathan Demme, a 35-minute piece that is a fun, informative question and answer session with the two main forces behind the wonderful Neil Young Journeys. 92Y Talks with Neil Young & Jonathan Demme is another Q&A session with the pair, with this piece running 33 minutes and taking place at the 92Y Cultural Institution and Community Center in New York City. 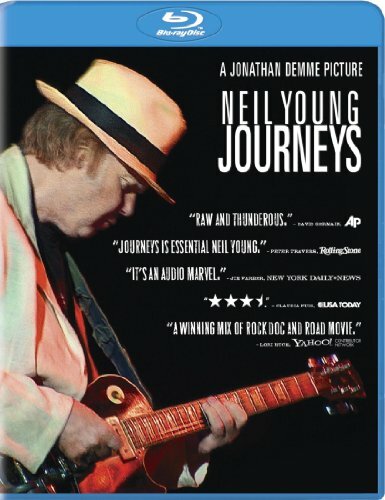 Finishing up this solid collection of supplements is the film�s theatrical trailer, and Making Journeys, a six-minute behind-the-scenes look at the making of Neil Young Journeys, with Young and Demme divulging some candid info while we watch on-set footage.